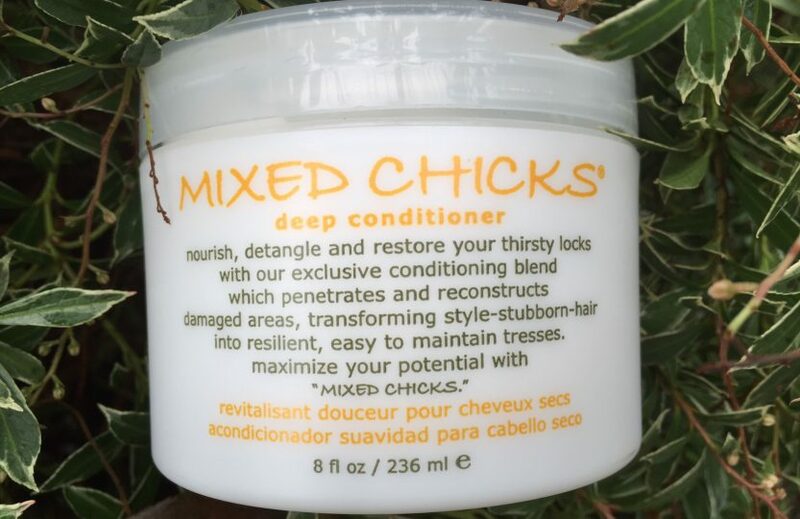 Update 12/10/2016: Mixed Chicks Deep Conditioner is marketed as a deep conditioner, but if you check out the ingredients and compare them with all the other conditioners, they are basically the same. This is a thicker product, but I’m assuming it’s thicker because they put less water in there. This is almost a whipped body butter consistency. I found the best way to use it was to take out a scoop and rub my hands together before applying. It combed okay, but wasn’t as slippery as my favorite combing conditioners. Like the ones I’ve marked as “Go To” conditioners, feel glass-like when you comb. This one had, I don’t know, sort of a textured feel when I combed, especially my ends. I think it was the amodimethicone. It isn’t my favorite silicone because it isn’t as slippery as I like and I’ve never felt totally confident with it, but it may be a personal preference. The combing was okay, but I wouldn’t go to if my hair was really tangled. It clumped well. It was fine as a smoothing conditioner every day, but again, it didn’t have the slippery, glass like feel I prefer. I’m going to recommend this conditioner, and this conditioner may be just what you are looking for. For me, I probably wouldn’t reach for it first, but it did an okay job. Which, considering how picky and paranoid I am, isn’t bad. Original Post 12/03/2016: There always seems to be lots of interesting products, even in regular drugstores, when I visit my mom in Kentucky. So I found several Mixed Chicks products I hadn’t seen out here in the Seattle area where I am. And I was happy to see that these products didn’t have the acrylate-type (hairspray/gel like) ingredients I’d seen in them before. So I snatched up lots of products to try out. First I’ll check out the ingredients further by looking them all up in my various tomes on ingredients and if that goes well, I’ll give them a try. I was only able to bring home one bottle in my suitcase of Mixed Chicks (this one), but my mom has promised to send the others, and I’ll review those when they get here. Or else I’ll snag them the next time I go back. So I looked at all the ingredients last night, and everything looked pretty good. I liked that they said they were vegan and cruelty free. I’m looking forward to trying them tonight.